Brace yourself, I finally created clean lemon bars! The truth is, I had to make this three times. The first time, the filling didn’t set at all and I essentially has a lemon syrup over cashew crust. Mini Chef lovingly refers to it as my “lemon disaster” (which he ate a bunch of… oh to have a 6 year old metabolism!). The second one turned out pretty well, and the third one never gelled as much as the second one. So I went back to the recipe for #2. I will tell you that these are pretty soft in the middle. They do not set like a traditional lemon bar. But they do set enough to get them cut and plated, and boy are they delicious! The cashew crust gives them some chew and the lemon juice flavor comes through nice and tart. It’s a fantastic combination! 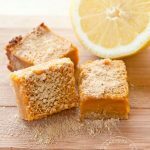 And now that I’ve finished this recipe, I have to say I will never make these clean eating lemon bars again. Not because I don’t love them, but rather because I do, just a little too much. I could eat the whole pan! It’s a good thing I’ve met a few people in this town or I’d really be in trouble. I have to give this stuff away or I’ll never reach my goals. But for special occasions, this dish is fabulous! And if you’re really concerned about the nutrition data, you can always cut them a bit smaller. It was a totally worthy sacrifice as far as I’m concerned and I’m happy to have given it a try! Note: These can be frozen for up to 3 months if wrapped well. Allow them to thaw on the counter for 30 minutes before serving. In a food processor, grind the cashews for approximately 20 seconds or until you have a coarse nut meal. Add in the pitted dates and honey and blend further for approximately 1-2 minutes or until everything is well blended. Empty the mixture out into an oiled 8 x 12 casserole dish (a dish that is slightly bigger is fine too.). Spread the mixture out evenly over the bottom of the casserole dish and then press down firmly to create a firm crust. In a medium mixing bowl, whisk together all the filling ingredients. Mix well to get rid of any clumps from the flour. Pour the filling into the crust and bake for 25 minutes. Cool enough to be able to set it in the fridge, and then chill in the fridge overnight. Cut into squares and serve. Note that when you take it out of the oven, the filling will still have some jiggle to it. This will go away as it chills. Recipe from the Gracious Pantry archives, originally posted 6/24/14. Kiarna – I hope you enjoy them! I was so excited!!! 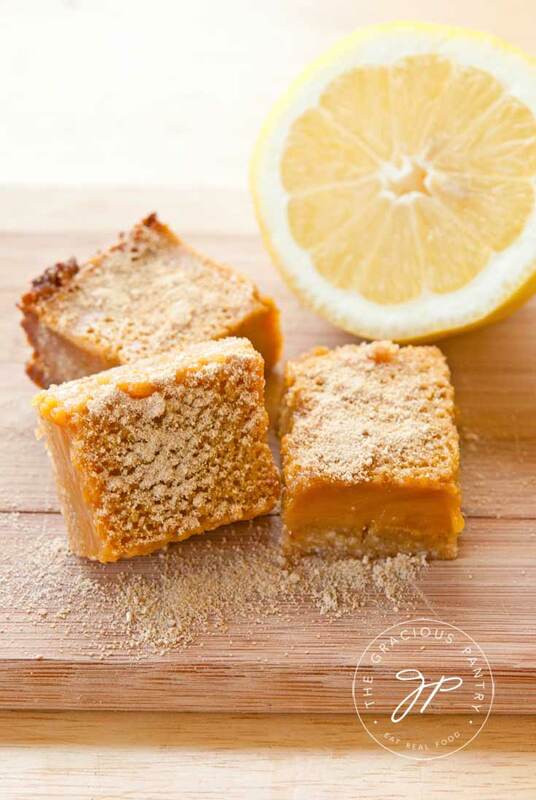 I have always loved lemon bars and really wanted to be able to eat them occasionally. Okay, crust is all Paleo, yes! Wait, the filling has flour? Ugh. Sorry Tiffany. Why does there have to be flour in the filling? Is that why it wouldn’t set before? Could you use arrowroot powder instead? What it boils down to is that as a Paleo eater I just can’t eat sweets any more. Sigh. Jodi – Yes, the flour sets the filling. If you prefer, you could try making a custard instead. Not sure how arrowroot would work. I haven’t tried. Arrowroot is more like cornstarch than flour but they are both used as thickening agents. I’d imagine if you use arrowroot, you wouldn’t need as much as the recipe calls for. Hi Tiffany, these look delicious! Just wondering if it would be ok to substitute raw almonds for the cashews because I have plenty of almonds on hand and no cashews. Thanks! Jamie – I don’t think it would hold up as well. You would have to mix in some sort of binding agent. Possibly an egg, but I think that would really alter the flavor. Cashews are perfect simply because they bind together so well when ground up. Maybe try making some almond milk with the extra almonds? Hi Tiffany, I have sugar-in-the-raw in my pantry. Would it be ok to use that instead of sucanat? Cady – Ya, something is definitely off there. The recipe is correct, it’s only 2 lemons. I’m trying to think what could have gone wrong, but I’m stumped. 8×8 should have worked just fine. I will have to mull this one over. Are you positive you followed the recipe exactly? Is there anything that can be used for the crust to substitute for the cashews? I have a nut allergy but I can eat seeds. Naomi – I haven’t tried it with seeds, but I imagine it could work. Though it may get a little crumbly on you when you dish it out. Worth a shot though! Hi Tiffany, can I use coconut oil instead of sucanat? Namida – One is oil and one is sugar. So I would not substitute one for the other, no. What are you trying to avoid?